After days of intensely hot and humid weather, today started with cool, fresh rain. Since my early starts are in order to beat the heat of the day, it was a real treat not to feel the pressure to get under way. Today is likely to be the last day that my overall direction is south; for the next stage I’ll be heading due east. The cooler weather took a lot of the pressure off me today and what with the number of long hills reducing I had a lovely, relaxed ride all morning. I got to a town called Revel at around lunchtime where I had my first traffic altercation of the trip. It should be no great surprise that it was with white van man. Since many of the town streets are so narrow, there is no option but to block the street when making deliveries. What irked me with this guy was that the driver looked at me and then ignored the fact that with his side door shut I could squeeze through. I asked him to shut the door to let me pass but he had a major dose of Le Attitude. There are times when I’m glad that not all the French I can speak was learnt at school, so while he was having Le Grand Winge I told him he could park his van in a shady spot next time and squeezed past. Later in the afternoon I reached a town call Castellnaudary where I had set a milestone of joining the Canal du Midi which joins the Atlantic to the Mediterranean. I was expecting a big sign but so much for expectations, just a slipway onto the towpath and off you go. There was a boat just coming out of a lock as I joined and a lady on deck (nautical term) was taking a picture of me. I smiled radiantly, said “Bonjour”, no reaction, said “Hello”, at which point another lady appeared and shouted at me “Have you had lunch? Would you like to join us?”. It would have been rude to say no, so within minutes of joining the canal I found myself on a lovely canal boat with a beer in my hand. It was the face that invites pity at work again. I spent a lovely hour with them eating a wonderful lunch and exchanging travel tales and then it was time to get my first taste of the tree-lined canal. I sailed along (cycling term) for about 20km and then decided to call it a day. All in all a really good day and one where I covered 90km in total – a personal best. There was thunder and lightning overnight last night and although I wasn’t (very) scared, what a row! The lightning illuminates the tent and then a huge boom – nature’s very own disco. The upshot was I didn’t have the best night’s sleep but thought that a day’s cycling along the flat canal towpath would be fine nevertheless. As it turned out, the sad truth is that the canal is beautiful but the path has been neglected and so, for long stretches, it’s little more than a rutted single track. Fine for bikes with suspension but not for mine, particularly when the bike is jolting, the panniers are bouncing and you’re hanging on like grim death for rut after rut after rut. It’s certainly very uncomfortable but it also means you can’t go at any great speed, so when I met an English couple going in the opposite direction and they told me that the path wouldn’t improve, I felt another executive decision was called for. I got to Carcassone and was keen to see the ancient walled city. It was built a few years before the canal so they don’t link up particularly well, which meant that I had to cycle through the city streets of Carcassone new town. After weeks of having lanes to myself it was a bit of a shock to the system to have to deal with heavy traffic. But I Percy Veered my way and eventually ended up at the Old City, however it was teeming with tourists and I could find nowhere that I felt comfortable leaving my bike with all my kit. So I made my second executive decision of the day. The decisions made today are: 1. 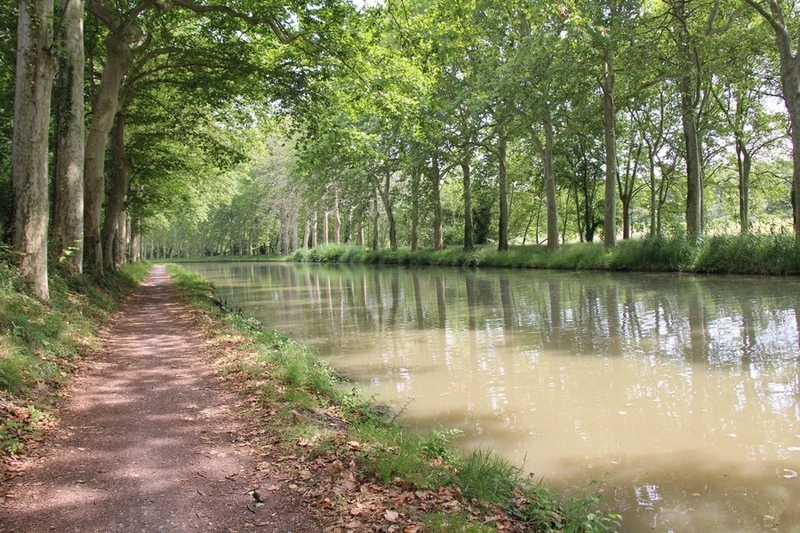 Abandon Canal du Midi and continue on roads rather than footpaths. 2. Abandon Carcassone visit with the intention to return at a later date with Basecamp. Since today has been full of such gay abandon, and I’m tired from a poor night’s sleep, I decided to abandon today’s ride, find a campsite and regroup for tomorrow. It was a great decision because I found a lovely campsite where my pitch was in the shade with the smell of the pines wafting in the warm air. My small but perfectly formed pitch. At long last the smell of the pine trees. Last night’s campsite in Rustiques was lovely – nice people, warm with a cool breeze and best of all the smell of pine trees. I got some washing done, had a lovely steak for dinner and slept like a baby. 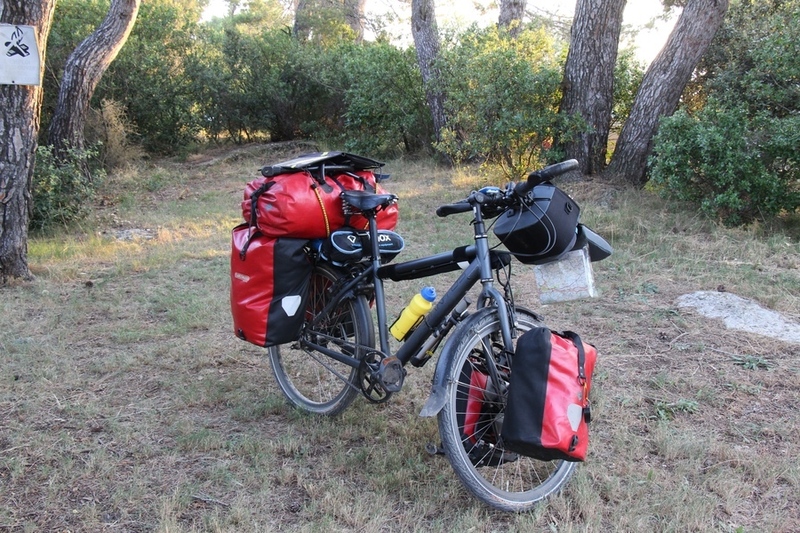 I set off early again this morning in the wonderful cool air along flat countryside, east towards Narbonne. Admittedly prior to starting the trip I hadn’t given it much thought but this morning’s ride was what I’d imagined and hoped for. Part of the ride was across some marsh lands which are being used to grow vines. Now in my ignorance I thought that vines thrived in a dry soil so I’m quite intrigued as to how these marsh vines are different. If you know, please send your answer on a bottle of Beaujolais to etc. etc. Although it got well over 30°C today there was a strong wind blowing that kept my thermostat under control which meant that I was able to keep going well into the afternoon. I’ve ended up on the Mediterannean coast south of Béziers in a holiday camp purporting to be a campsite but in my humble opinion has got a lot of Le Hi de Hi about it. Because this is Family Holiday Central there’s not much choice but I shan’t be sorry to move on. Last night’s campsite was the most expensive so far at €24 and by far the worst. What with kids running around screaming everywhere until 10pm followed by teenagers doing much the same and the pounding beat of euro disco music from all the adjacent ‘holiday’ camps, by 1am I’d just about had enough. I thought I was unlucky to be near the playground but the chalets are so close together that to call it a holiday resort is more than just a stretch of the imagination. My only thought is that they’ve made the place so awful that after a two week stay it makes you realise that home is not that bad after all. So today’s ride started with me feeling very weary and unsurprisingly it was perhaps the most unenjoyable ride of the trip so far. It was interspersed with lovely bits along canal towpaths but I had to use main roads far too many times, and I was unable to avoid going through large towns like Agde. At one point I went the length of a long, narrow one way street the wrong way which was not the most relaxing part of the day. In fairness, only one driver felt the need to have a horn tantrum, the rest just moved out the way, which was a relative relief. The ride also took in miles of sandy coastline along a cycle path which was a blessed relief from cars and lorries but by the time I got there the heat and wind had got up, so the rest of today’s ride had a bit of the Paris – Dakkar Rally about it. After two nights of poor sleep I had a horror of ending up in another holiday camp for the night but as it happened the campsite gods were smiling and I came across a ‘Camping á la ferme’ which generally means no bouncy castle, bingo or screaming kids. In this case the farm was a vineyard producing sweet Muscat wine but when I saw a sign saying ‘Campsite Full’ my heart sank. Despite the dodgy omens I knocked on the door and the owner, Henri, couldn’t have been nicer and said that he always had space for cyclists. He found me a small but shady spot next to two very nice French families, one of whom took me in their car to get some grub from a local supermarket. Later, we ended up having a tasting session of Henri’s wine which slid seamlessly into aperitif time and a very mellow evening. Today was very special. 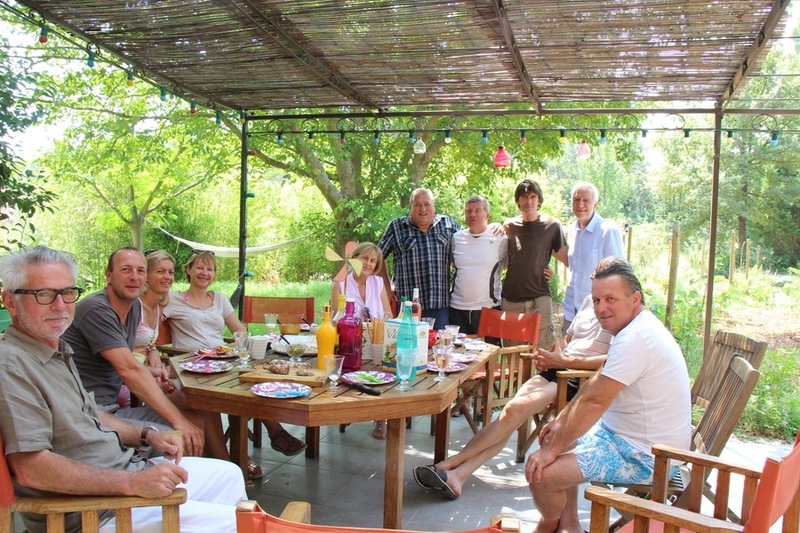 I phoned my friend Eric who lives near Aix en Provence and who was the cause of this adventure in the first place, about my plans to cross the Camargue and my expected arrival date at his house, two or three days from now. He said that was all fine but he was due back at work at the end of the week, the temperature in the Camargue can get up to 40°C with a fierce wind and mosquitos with attitude at night. Would I like for him to come and collect me in the car this morning? I agonised, deliberated, weighed up the options and then faster than you could say “Encore une bière”, said “Oui merci” (You bet). 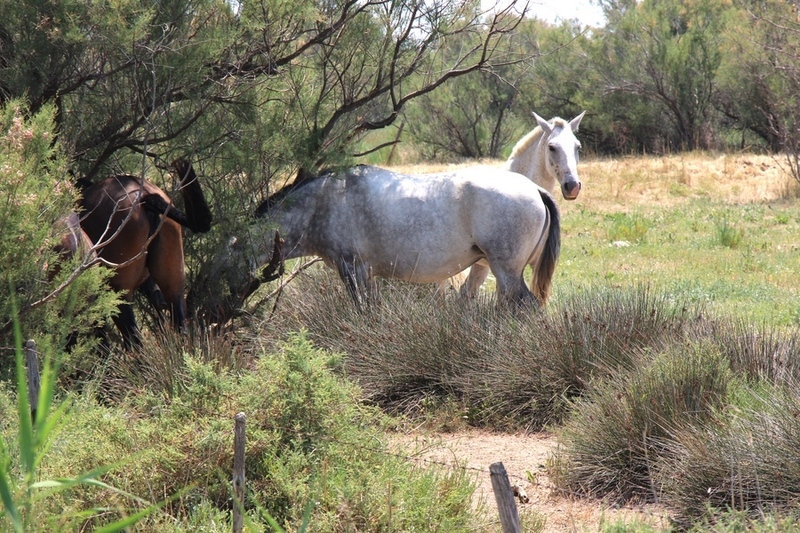 We spent the day in the Camargue seeing wild horses, bulls and flamingoes in the wetlands and had a fabulous restaurant lunch. I hadn’t appreciated just how big the area is and sure enough the wind didth blow. On the way home we were on some very busy roads with some very big climbs. I didn’t make it all the way to his house but after approx 1200km, deserve it or not, I gave myself a break. Wild Horses couldn’t drag me away from a very welcome lift. So after about 1200km, having reached my friend Eric and his wife Virginie (Vini) in the south of France and 4 weeks on a bicycle saddle, in more ways than one I have reached Rock Bottom (not to mention Dead Leg). After a week’s break I’ll start my journey north towards Dieppe. Eric and Vini have always been the kindest, most generous hosts, but today they outdid themselves as they laid on a surprise reception lunch for me and 15 or so of their friends in my honour. Their friends were both supportive and incredulous at my efforts and although I’ve come this far purely for the pleasure and adventure they made me feel very special and today was without doubt the high point of my trip so far. A warm and wonderful reception. I’m going to have a breather from Dear Diary for a few days but will resume when I set off again next week. I arrived in St. Malo on 18th June and went through Brittany to La Vendée, Charente Maritime, Dordogne and the Périgord. 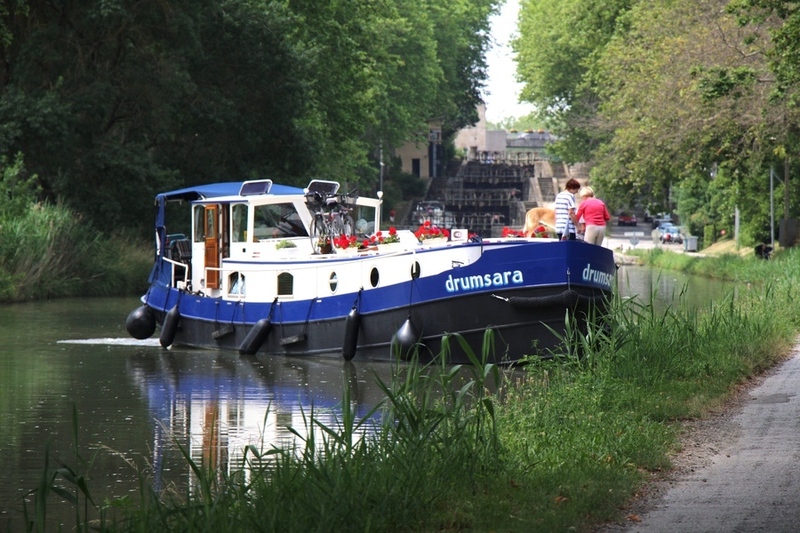 After that, the Canal du Midi near Toulouse to the Mediterranean Coast at Agde and on to the Camargue where I was picked up for a very welcome break. 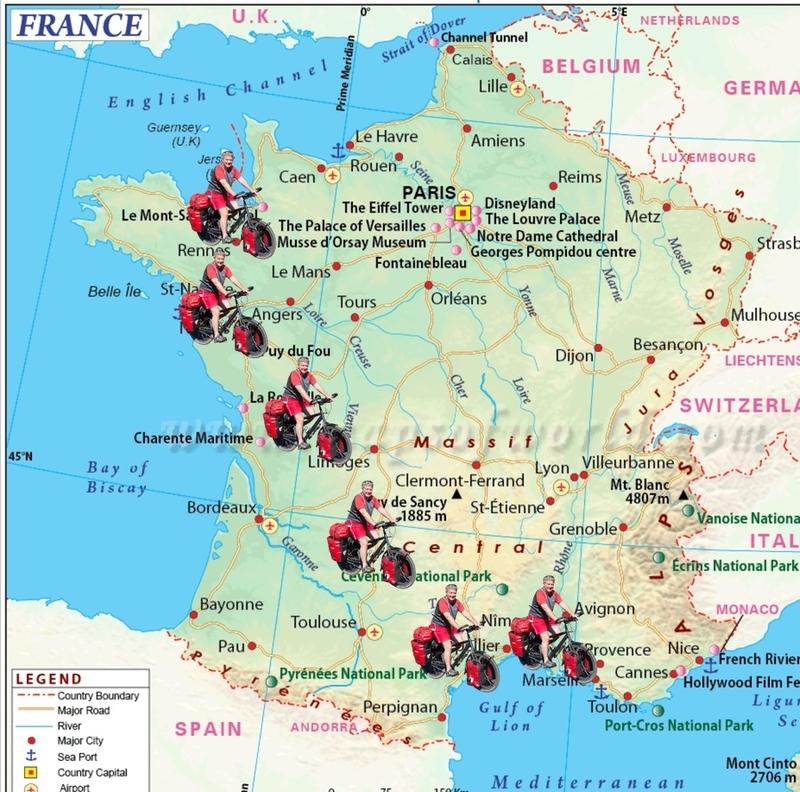 I plan to continue my tour with the slow ride home to Dieppe on Monday 22nd July. Hope you had a good rest at Erics look after your bum & legs we see u started your way back cheers 4 now Ken & steve. It was hard to get back into it but I’m going well again now. The temp is up to 36°C today so slightly cooler would be nice. Un petit message d’encouragement à toi Richard pour cette belle aventure que nous avons partagée un soir au camping de Vic la Gardiole autour d’un verre de vin ! Nous t’embrassons et te soutenons dans ce périple sportif et amical. Merci Corine. C’était une tres bonne soirée et c’est dommage que je n’avais pas l’espace dans mes sacoches pour prendre encore du vin. Maintenant je suis juste au sud de Macon et comme tu le sais bien il fait tres CHAUD! !